At first this was going to be kale and tofu soup, but I got veggie happy and started adding anything I could find! Final ingredient list: Kale, Tofu, Celery, Brussel Sprouts, Tomatoes, Red and Yellow Bell Peppers, and a Seeded Jalapeno. Good healthy soup! Poblanos are delicious and nutritious! They take a little more effort to prepare but well worth it. I fire roast them on a open flame, then put them in a paper bag for 5-10 minutes and the rough outer skin just pulls right off. This was a pleasant change of pace. I forget about using cabbage when you saute meals in a skillet. I'm still stuck on using it only in soup. 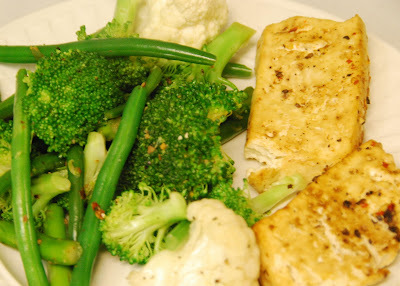 So simple, so delicous, so healthy. Vine ripened toamtoes and pieces of fresh basil leaf. This is a new healthy snack to add to my arsenal. Central Market is pricey, but they have the best produce. This haul should provide nutritious meals for awhile. A nice healthy lunch. I bought some fresh brussel sprouts for the first time and they are pretty good. I boiled these a little too long but they are still good. I've read that you lose a lot of nutrients when you boil or cook many vegetables, but then I also read cooking certain items allows you body to absorb more of their nutrients(e.g. tomatoes and lycopene). I like the idea of eating more raw foods, it just seems natural. Salads are so good when then have variety. 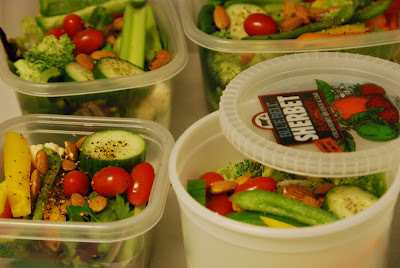 These have spinach, iceberg lettuce, mixed field greens, red orange green yellow bell peppers, cucumbers, almonds, grape tomatoes, celery, broccoli, cauliflower, and ground pepper. That's like ~13 different healthy raw foods! 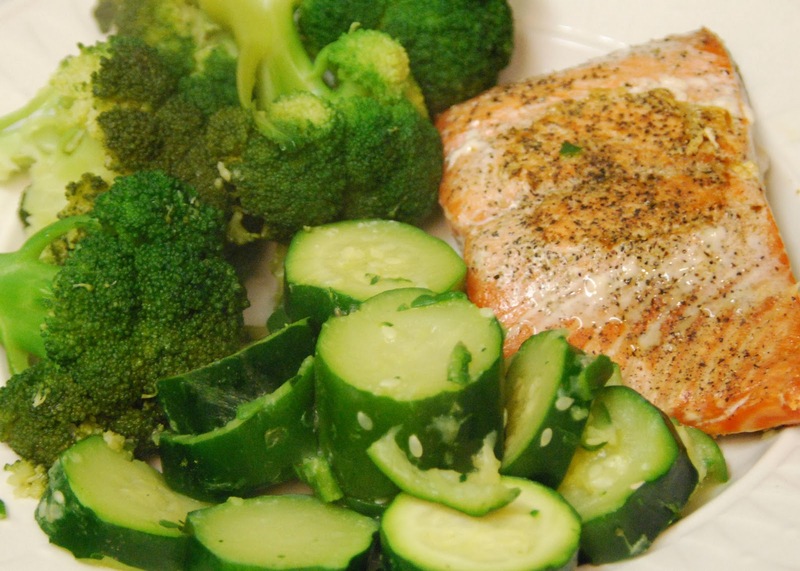 Sockeye Salmon, Zucchini, and Broc. A good healthy meal. I am glad I gave the zucc a second chance, its not bad. Maybe I will revisit squash and see it is as horrible as I remember.